Tucked among Smoky Mountain trees on a semi-private lot is Serenity’s Clear View. This updated Pigeon Forge cabin offers privacy in the rolling Smoky Mountain hills and sleeping space for up to 5 guests. Choose Serenity’s Clear View for a couples’ getaway to the mountains, a romantic weekend away, or a family vacation in the summer. You’ll love the privacy this cabin affords with a location about 12 miles from downtown, and you’ll find plenty to do inside this cabin on a rainy day. Enjoy a living room with big screen TV and amazing mountain views, a pool table in the game room, and a cozy master suite with an indoor jetted tub. 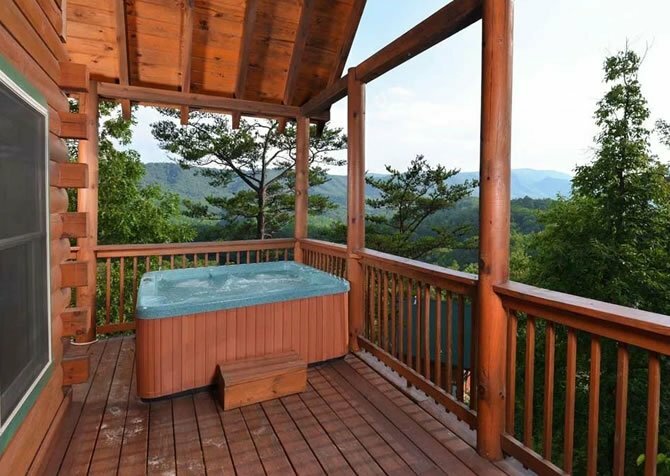 This cabin even offers an outdoor hot tub and a private sauna inside if you’re looking for extra ways to relax while staying the Smokies. Enjoy all this and more at Serenity’s Clear View, a 1-bedroom, 2-bath cabin surrounded by green trees in the summer, colorful foliage in the fall, and mountain views all throughout the year. The place everyone tends to migrate to on any family vacation is the living room, and inside Serenity’s Clear View, you’ll find a living room that’s large enough for 5 guests. Snuggle up on the couch or kick back on the leather recliner for movie night inside your Smoky Mountain rental. 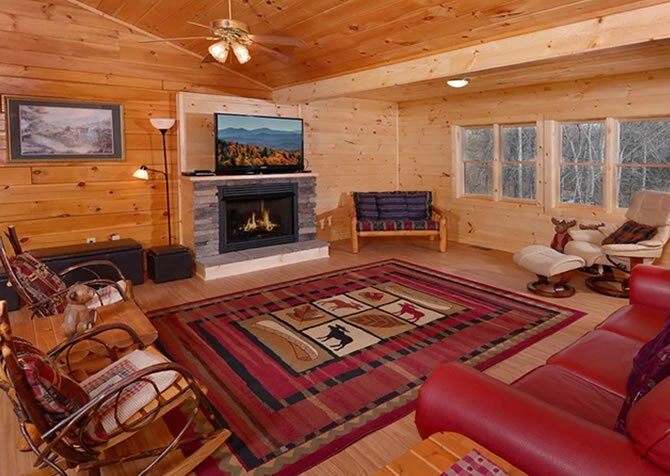 This cabin’s living room offers a big screen TV mounted above the fireplace that’s equipped with a Blu-ray player, so all you need to bring is your favorite collection of DVDs! When the nights turn chilly on top of the mountain, be sure to turn on your gas fireplace, which is surrounded by natural stones that reach all the way to the ceiling. If you can’t find anything on TV, you’ll also have the option to play games on your favorite devices thanks to this cabin’s high speed wireless internet access. But if you’re wanting to stay connected as a family, try one of the board games provided by Serenity’s Clear View instead! Another important feature of our Smoky Mountain cabins is their fully equipped kitchens. Inside Serenity’s Clear View, you’ll find a large kitchen with updated appliances and ample counterspace. Enjoy all your major appliances, including an over-the-range microwave, electric stove and oven, dishwasher, and full-size refrigerator. This cabin also provides an island in its kitchen, which provides more space for prep work and serving – along with a breakfast counter with 3 stools. The kitchen doubles as your dining space inside Serenity’s Clear View. Besides the breakfast bar, you’ll find a matching stone table with room for 2. Both dining spaces are positioned next to large windows with views of the Smokies and the surrounding trees. If you’re looking for a private place to share a meal in the Smokies, this cabin’s dining area/kitchen is it! You’ll love the views, the coziness, and the modern look this Pigeon Forge cabin provides. Pigeon Forge is loaded with downtown attractions where you can take your family for a full day of fun. When planning your big day in Pigeon Forge, don’t miss one-stop attractions like The Island, where you’ll find Arcade City, the Great Smoky Mountain Wheel, tons of shops, and delicious Southern-style restaurants. You can also try crowd favorites like the Titanic Museum Attraction and the Hollywood Wax Museum. But when you book your stay at Serenity’s Clear View, you’ll have options for fun right inside your Pigeon Forge cabin—like in the upstairs game room! Enjoy a full-size pool table inside this space, along with a flatscreen TV mounted to the wall. You can play a round of pool while you watch the big game, and when you’re ready for a break, simply kick back on the sleeper sofa against the wall. 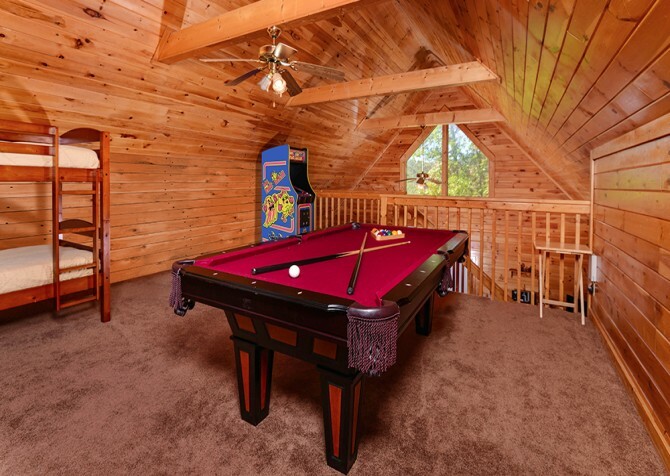 This game loft also doubles as a bedroom for the kids and/or extra guests joining on your Pigeon Forge getaway. With a twin-over-full bunk, you can comfortably sleep up to 3 guests inside the Serenity’s Clear View loft. Featuring a king-size bed set on a traditional wooden frame, the master suite will be a cozy space to retreat to after playing with the kids at a downtown arcade or horseback riding with your sweetheart in the Great Smoky Mountains. Along with the king-size bed, enjoy an end table and reading lamp, a ceiling fan, a wooden bureau, and a flatscreen TV in this large master bedroom. Want to really treat yourself? 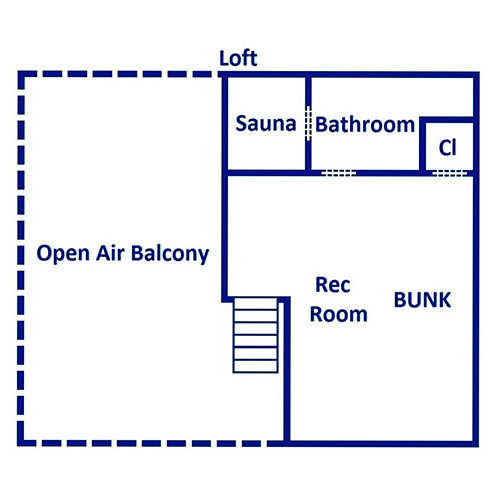 Climb into the private sauna inside! Serenity’s Clear View also offers 2 full bathrooms for your small group to share. 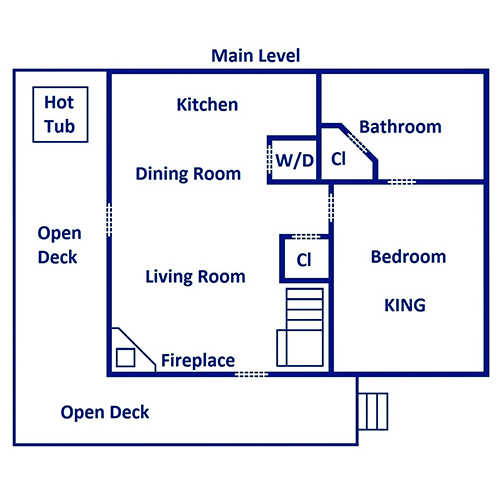 Both are tiled and offer bathtubs and showers. As a bonus, one of the bathrooms offers a large, indoor jetted tub for soaking and relaxing. These, along with the outdoor hot tub on the porch, mean you sure won’t run out of ways to catch some much-needed rest and relaxation during your stay at Serenity’s Clear View! If the name didn’t already give it away, one of the best reasons to book your Pigeon Forge stay at Serenity’s Clear View is for the amazing mountain views! Right from your open-air back porch, you’ll enjoy views of the tree-studded hills. In the fall, the colors of the foliage will wow your guests, and in the winter, the rolling mountains will be the perfect backdrop to holiday meals and cozy afternoons around the fireplace. 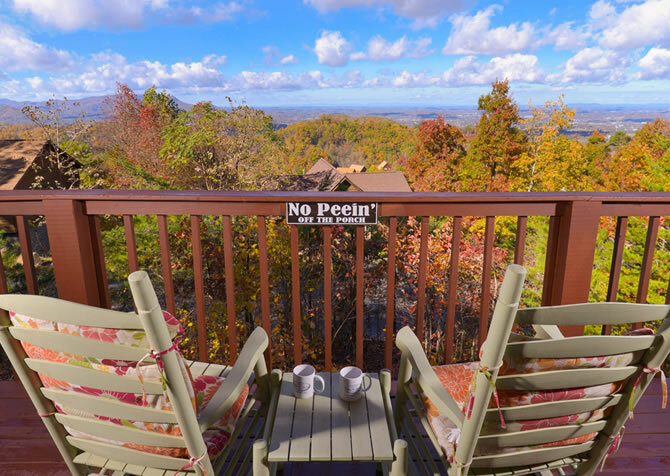 If you’re hoping to sip your coffee on the porch, you’re in luck at Serenity’s Clear View! This cabin provides a row of rocking chairs for your early morning routine, and in the evening, change into your bathing suit to enjoy a dip in this cabin’s outdoor hot tub. Serenity’s Clear View also provides a charcoal grill—perfect for Fourth of July cookouts or a romantic steak dinner for 2. We’ve already mentioned a long list of amenities that includes a big screen TV and DVD player, high speed wireless, an indoor jetted tub, an outdoor hot tub and grill, and much more. Besides all this, Serenity’s Clear View also provides access to a washer and dryer, which you’ll need after hiking in the Great Smoky Mountains National Park, and access to a flat, paved driveway (with room for 2 vehicles). Even the roads leading to this cabin are flat and paved, so you should have an easy time traveling to and from Pigeon Forge when you stay at Serenity’s Clear View. What better way to see the Smoky Mountains than to zipline over them at Wears Valley Zipline Adventures? Take the whole family and enjoy the day zipping through the trees! You control the speed on this mountain coaster, where you can ride with a friend or on your own to experience the thrill of racing downhill! This national park is FREE to all its guests and provides more than 800 miles of hiking trails, along with bike paths, fishing creeks, picnic tables, and more. "We had a fantastic time this past week taking a break from our home business after a crazy holiday season. Serenity’s Clear View was just what we needed. Getting “snowed in” for a couple days made it even better."